For those of you who have been following us closely over the past 2 years, you will know that it has been a crazy ride. As Matt (our vineyard manager) said a little while ago, other than the vines themselves, there is nothing we haven’t changed. New labels, new wines and a cellar door which opened for the first time last November are just a few of the things which have been taking up our time. 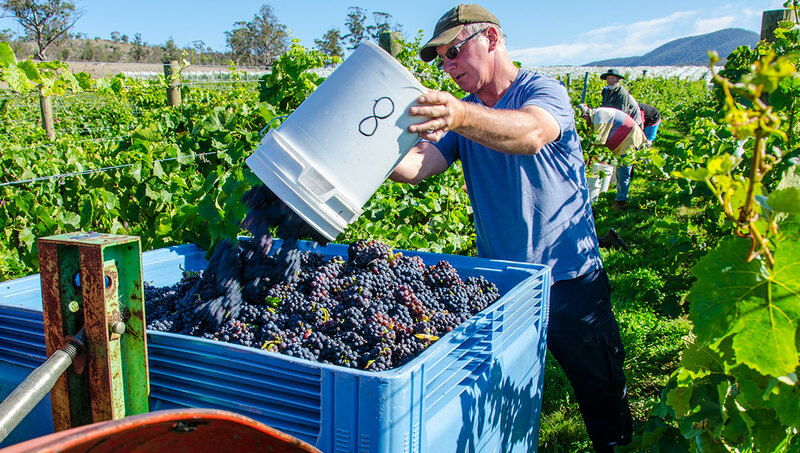 Add to that cuttings of three new varieties waiting in our nursery, (more of them in future newsletters,) being named Tasmanian Winery of the Year in the Melbourne International Wine Competition and an ostrich (? yep, I said an ostrich…read on,) then all in all it has been an exciting time. Almost more exciting is the change in perception of this beautiful island which is our home. No longer are we the poor cousins shivering on our cold rock somewhere near Antarctica; no longer do we have to wear high collars to hide the scar and no longer do we have to walk across the tarmac at Melbourne to get a plane home. Instead there is a newfound appreciation of where we live and the things we get to eat and drink every day and everyone seems to want to come and share it with us. And everyone is welcome. Lastly, thank you to all of you who have supported us. Whether you tasted our wines in Perth, Brisbane, Sydney, Melbourne, at Taste of Tasmania or in our very humble cellar door, we love having you with us and look forward to sharing the journey to come. Another brand new idea is our Lucky 8 Wine Club. As the number 8 is considered very lucky in China (and of course we think everyone in the Nocton family is very lucky,) naturally we called our wine club the Lucky 8. We don’t insist that you must buy wine from us to remain a member but we are confident that you will want to. To join simply fill in your email on the front page of the web site or give us a call.